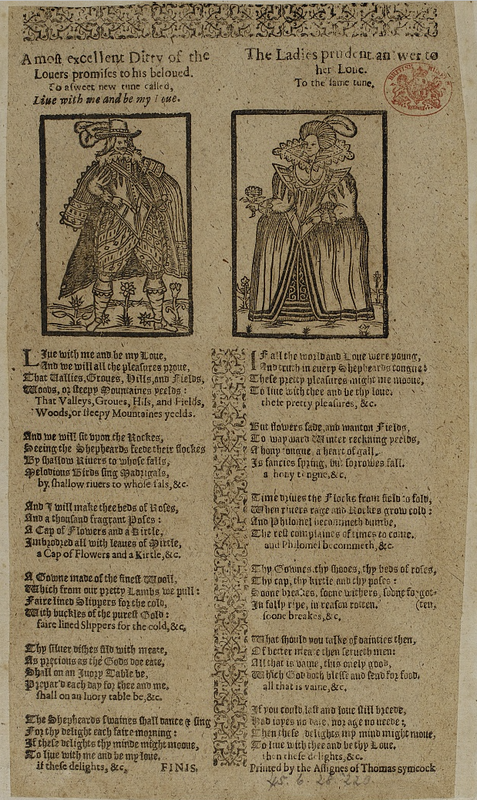 About the Broadside: This page is all about the printing of Christopher Marlowe’s poem “The Passionate Shepherd to His Love” as a broadside ballad. Here you will learn a bit about the printer of the broadside, Thomas Symcock, who is as interesting and mysterious as Marlowe himself, the specifics of the broadside ballad, some information on the collection the broadside was preserved in, and the full ballad transcription, so you can see how different it is from the original printing in the Passionate Pilgrim. Tune Imprint: To a sweet new tune called, / Live with me and be my Love. Authored by: Christopher Marlowe and Sir Walter Raleigh. The majority of ballads were printed in London. The printer of Marlowe’s broadside ballad, Thomas Symcock (Symcocke), was a registered printer from 1619-1629. When Symcock applied for a printing patent in October of 1618, it was for the “sole printing of briefs and papers.”6 Printers like Thomas Symcock “dealt with the sale and printing of ballads on a large-scale” and “were often involved in the publication of news-sheets and cheap, small-scale popular literature.”7 Not much else is known about Thomas Symcock; what information we have derives from his printing patent, surviving prints, and his connection with some printing-oriented drama involving King James I and The Stationers’ Company. In 1557, The Stationers’ Company trade guild was given a royal charter. As printing grew and more printers popped up in London, issues of censorship and stock began to sprout. In 1615 and in 1619, James I granted a monopoly to Roger Wood and Thomas Symcock (requested by Marín de Boilsoré) for 31 years.8 This charter allowed Wood and Symcock a monopoly on on-the-side printings, “an extremely wide category that included classes of works like playbills, briefs for casualties, and apprentice’s indentures, all of which belonged through Register entry to individual Stationers.”9 This patent benefited the King to the tune of 10 pounds annually. This quickly became a problem, and in 1621 The Stationers Company petitioned Parliament for the patent to be removed. Nothing was done until 1628 when the issue was taken to Parliament and a committee was appointed by King Charles I to examine the situation. The patent was then withdrawn.10 There is not much more on Symcock printing after the withdrawing of the patent. 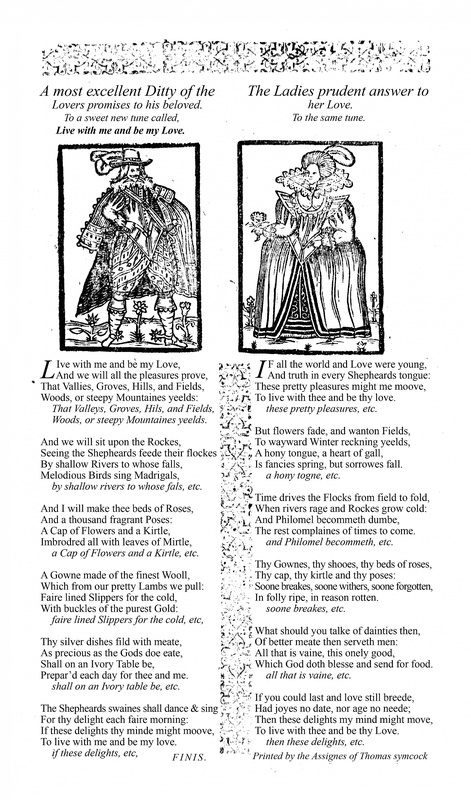 Since there is no date printed on the broadside ballad A most excellent Ditty of the / Louers promises to his beloved, it falls under the general dates of 1619-1629, when Thomas Symcock was actively printing. Below is a transcription of the broadside ballad text (left) and the Facsimile Transcription from the EBBA website. Please note, the broadside ballad does include the “reply” attributed to Raleigh under the title of The Ladies prudent answer to her Love. 1 British Library, Roxburghe 1.205, EBBA 30141. 2 A “ditty” is a short simple song; see Ballad Glossary. 3 You’ll learn all about what EBBA considers a standard tunes next, in The Tune. 5 Fumerton, Patricia ed.,“The Roxburghe Collection.” English Broadside Ballad Archive. 6 Willoughby, Edwin Eliott. A Printer of Shakespeare; the Books and times of William Jaggard. London, P. Allan, 1934, p. 160. 7 Baron, Sabrina A., Eric N. Lindquist, and Eleanor F. Shevlin. Agent of Change: Print Culture Studies after Elizabeth L. Eisenstein. U of Massachusetts, 2007, p. 273. 8 Dugaw, Dianne. The Anglo-American Ballad: A Folklore Casebook. Garland, 1995, p. 274. 9 Clegg, Cyndia Susan. Press Censorship in Jacobean England. Cambridge UP, 2001, p. 44. 10 McKerrow, R. B. et all. Dictionary of Printers and Booksellers in England, Scotland and Ireland, and of Foreign Printers of English Books 1557-1640. 1910 (Bibl Soc), pp. 261-62.